I’ve had a pet ladybug for a few days. It came out of nowhere, flying by my computer in a blur and landing on the ceiling. I immediately grabbed a tissue to kill the pest, but when I climbed onto my chair and discovered that it was a ladybug [actually I think it’s of those ladybug lookalikes], I got cold feet. Disposing of any kind of insect is usually not a problem for me [I HATE bugs in the house], but I just can’t bring myself to kill ladybugs. So I trapped it in an empty water bottle instead while trying to decide what to do with it. “Well, throw it away,” she replied. “It’s still alive,” I added. Not very helpful. So I brought it back into my room and set it on the desk next to me, examining the little creature as it explored the interior of the bottle. It was so small yet intricate, and as I stared, I could feel a one-sided bond forming. Thus, I decided to keep it as a pet. Then again, when there’s no consent given from the so-called pet, what’s the difference between a pet and a prisoner? I haven’t given the ladybug a name [I don’t even name my stuffed animals], but I send it good feelings every time I pass it while walking in and out of my room. Sometimes it crawls around on the sides, sometimes it sits on the bottom, and other times the bottle looks empty, and I know that the ladybug is sitting in the darkness right underneath the cap. I surmise that it’s sleeping. 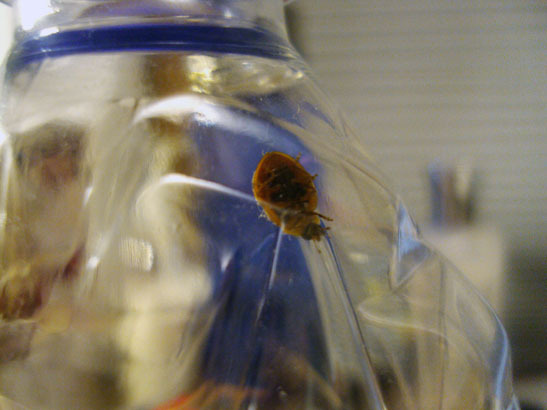 The water bottle had a bit of water still inside, so the ladybug has something to drink if it wants. Apparently these things eat aphids and larvae, which is your fun fact of the day. Without anything to eat, it will probably starve to death soon, which I’m trying not to think about. I have necrophobia, which is the fear of dead things — seriously, I’m more afraid of dead spiders than live ones — and I definitely don’t want a dead pet on my hands. I suppose the larger question that I’m pondering is whether I have any right to take a being captive, even a tiny insect, and decide what’s best for it. This is one of the reasons I’m reluctant to own a real pet. To keep a dog on a leash or a cat in a house…I wonder if they are truly content that way. im always conflicted about killing (or rather, ordering someone else in the house to kill) spiders that i spot in the house. They supposedly eat other insects. pets are domesticated animals..so i would say theyre pretty satisfied. wild animals though..
You are currently reading The Asian Lady Beetle at auradis.